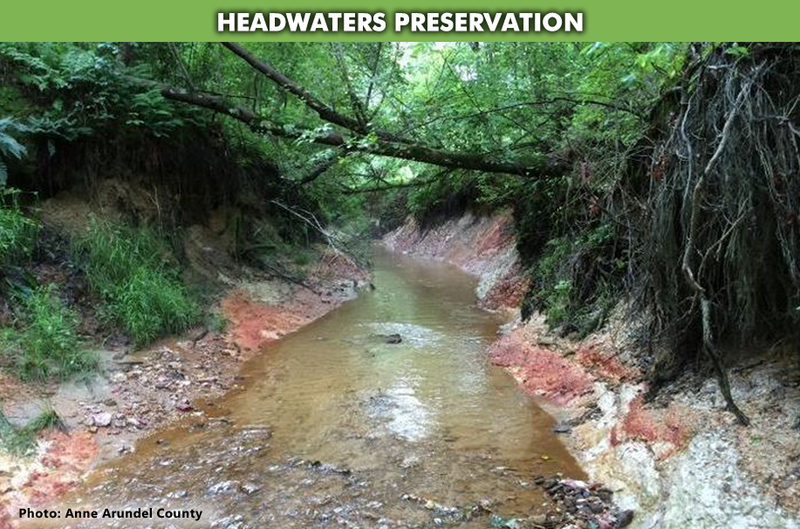 Our headwater creeks, once bustling home to fresh-water trout, are on verge of total collapse! Just a generation or two ago the headwater creeks of the Severn River were nirvana for recreational anglers. Brook trout require clean, cool, running water and cannot tolerate water temperatures greater than 75 degrees F. With ample shade provided by a largely intact lowland forest of red maple, river birch, sycamore and ash, the Severn’s headwater creeks provided ideal spawning grounds for trout. On any early spring morning, you’d see a long line of cars parked along the shoulder of a quiet, two-lane highway known as Rt. 32. Anglers crowded the creek beds to try their luck on the branches of the Jabez, Severn Run and Bear Creek. But along came construction of the eight-lane Interstate I-97 and Rt. 32 overpass complex. This new highway spurred rapid development in the Severna Park-Millersville area that surrounds our headwater creeks. Stormwater runoff from the highways, and massive failures of runoff control systems have poured mountains of sand and dirt into the headwaters, virtually burying the creeks. So much sand has run into the headwater coastal plain that sandy islands appear in the river itself after big storms. Result: Trout habitat has been devastated. Creeks with deep ravines have replaced the once lazy flow of flat-land streams. Our remaining fresh-water trout now struggle to survive in a tiny quarter-mile stretch of the Jabez Creek. The Severn River Association joined forces with the Severn Riverkeeper to organize citizens to pressure county and state agencies to see the damages caused by their roadway investments.